Amplifier also allows you to Import Orders. This tool is essential for many Clients.Importing Orders is a very useful tool, and is especially important for those who have successfully crowdfunded using platforms like Indiegogo or Kickstarter. Click the "Import" button in the upper right region of the page. Click the "Choose File" button and select the .csv file you would like to import. Select the order source in the menu under "Where did these orders come from?" Click the import "Status" under the "Import" button drop-down. Confirm that your orders were successfully imported by reviewing the "Successful" column on the Status page. Though not all fields are required, we recommend that you provide all applicable data, particularly related to the item cost, under UnitPrice. If provided, UnitPrice will determine the declared value for all international shipments for the purposes of customs declaration. If not provided, the item's configured price will be used instead. In short, the UnitPrice will determine how taxes are applied by the destination country's customs office, so make sure that is accurate if it differs from your configured item price. For orders containing multiple items, the related customer information must be included on the adjacent lines. As a final step, it is also worth sorting by OrderID, as our system will ignore any non-adjacent items as a duplicate order. It is incredibly important that your data be accurate. You are responsible for the accuracy of your data. 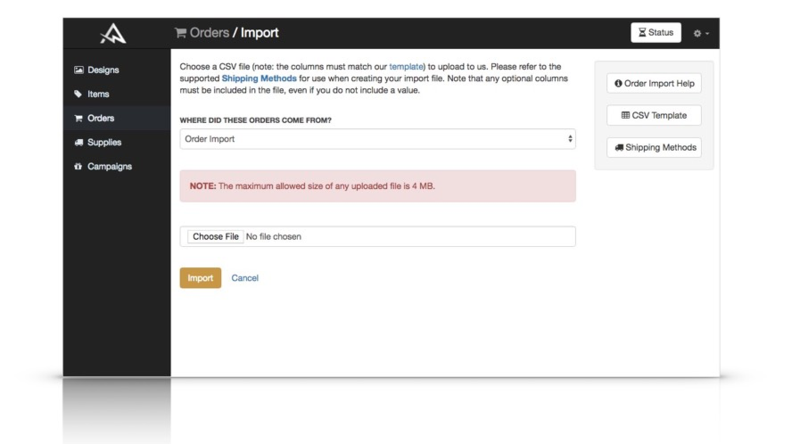 Once orders are successfully imported, there is no guarantee that we will be able to stop fulfillment in the event of an error in your order data. As such, take the time to thoroughly review your .csv file before attempting to import. If your CSV file contains formatting errors, Amplifier will let you know exactly what failed and why in the Import Status screen. Understanding the required values will keep those failures to a minimum. If one or more orders fail import, just click the flag in the "FAILED" column on the Import Status page. You will be provided feedback for any values that failed validation. 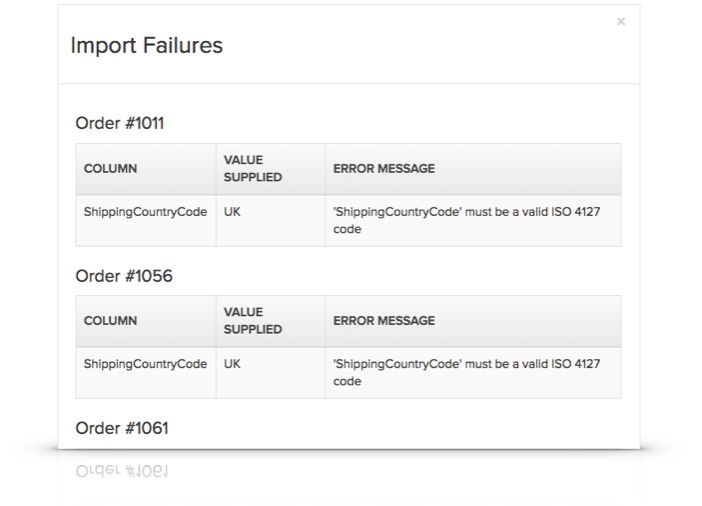 Click the "Download Failed Orders" button at the bottom of the Import Failures summary to download the consolidated list or failed orders. Just correct the issues and attempt import again as needed.